Do you like Dino Jump? Share it with your friends. 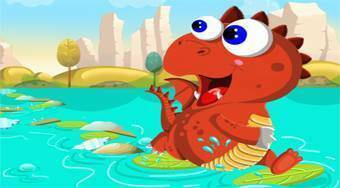 Dino Jump is a great jumping game in which your task will be to jump with a cute dinosaur over the water of the lake. Jump over platforms and leaves, try not to fall into the water and get as far as possible before the time runs out. Use the left arrow to jump one field and use the right arrow to double.